Diploma in Electronics Engineering is a three year diploma program. It deals with electronics engineering and its aspects. It provides depth knowledge theoretical and practical to students and makes them able to work in industry. It is a field of engineering that deals with the study of electricity, electronics. It became a occupation in later 19th century after electricity commercialised. It is having now many subdivided subfields including electronics, digital computers, power engineering, signal processing, electronic engineering, RF engineering etc. The term "electronic engineering" denotes a broad engineering field that covers subfields such as analogy electronics, electronics, consumer, embedded systems and power electronics. Electronics engineering deals with implementation of applications, principles and algorithms developed within many related fields, for example solid-state physics, radio engineering, telecommunications, control, signal processing, systems engineering, computer engineering, instrumentation engineering, control, robotics, and many others. For applying to Diploma in Electronic engineering students must have 10th passed with 2 yrs. exp. After having diploma in electronics engineering students may have below career opportunities. In the field of electronic engineering, engineers design and test circuits that use the electromagnetic properties of electrical components such as resistors, capacitors, inductors, diodes and transistors to achieve a particular functionality. The tuner circuit, which allows the user of a radio to filter out all but a single station, is just one example of such a circuit. In designing an integrated circuit, electronics engineers first construct circuit schematics that specify the electrical components and describe the interconnections between them. When completed, VLSI engineers convert the schematics into actual layouts, which map the layers of various conductor and semiconductor materials needed to construct the circuit. It is one of the most sought engineering programs today in India and outside too. 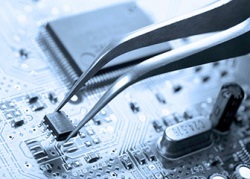 Many colleges, universities, institutes are providing many courses in electronics engineering. Today we are using a no. of electronics objects in our daily personal and professional life from home to companies we are using various items. Most of the things are auto mode today and using electronics functionalities. Electronics engineers are in great demand by many of government organizations like BHEL/BEL and many of private sector companies like Godrej, L.G., Samsung, Hitachi and many others.